Skopje is the capital city of the Republic of North Macedonia located in the center of the Balkan Peninsula, southeastern Europe. It is a city of many cultures and rich history. Over time it has experienced Roman, Byzantine and Ottoman rule, each of which leaving visible reminders of their reign, forming quite an interesting city. Skopje is internationally famous for being the birthplace of Mother Teresa. 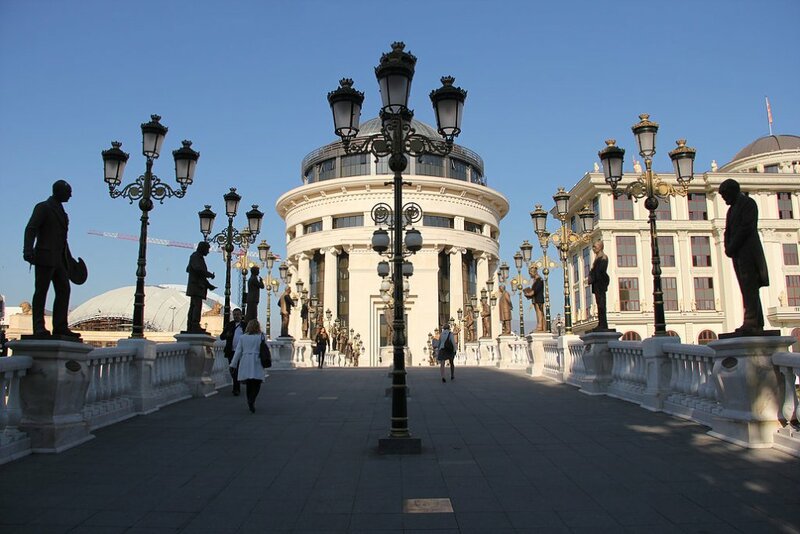 There are many things to do in Skopje. While it is not your typical destination, it is certainly a destination that deserves far more attention. We have put together a list of ten reasons why Skopje should be on the top of your list as your next travel destination. Walking around the city it becomes obvious that Skopje has a long and rich history. There are multiple Dardanian and Roman-era archaeological sites; Byzantine and Serbian Empire churches and monasteries; a great wealth of Ottoman heritage and other Brutalist structures that recall the Yugoslav era. Kale Fortress for example traces back to the Byzantine rulers of the 6th century and the historic Old Bazaar in Skopje has been the city’s center of commerce since the 12th century. The people of Skopje and Macedonia are some of the most welcoming and hospitable lot that you’ll ever meet. They are warm, accommodating and helpful. The official language is Macedonian but almost everyone speaks at least rudimentary English. The Old Bazaar, also called ‘Carsija’ is the Turkish old town of Skopje. It is one of the oldest and largest marketplaces in the Balkans, and it has been Skopje’s center for trade and commerce since at least the 12th century. The area is home to mosques, türbes (mausoleum tombs), converted hammams (bathhouses) and churches. You will find everything here form small souvenirs and copper-ware, to folk costumes and jewelry. 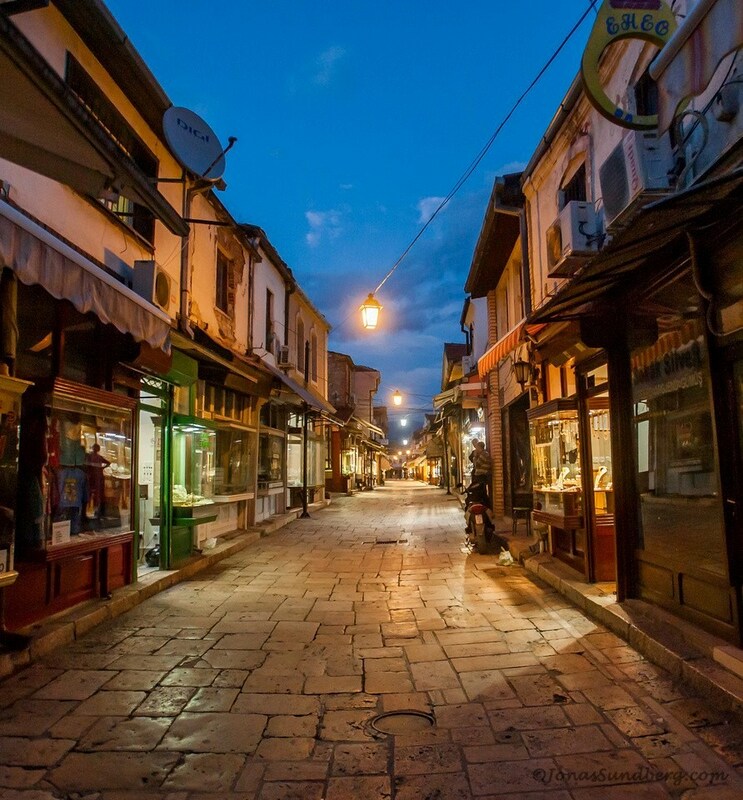 Strolling the shops of the Old Bazaar is a must-do for anyone visiting Skopje. Above all, Carsija has various traditional restaurants and coffee houses where you can try Turkish coffee or tea and do not miss Destan’s traditional kebab either! On Friday and Saturday nights Carsia becomes even more lively with youngsters due to some great bars in the area. Check out Menada Bar and also the Old Town Brewery (Пивница Стар Град). Macedonian food is amazing! It has Balkan and Mediterranean characteristics, influenced by Turkish flavors due to the long centuries of Ottoman rule. The country has top quality fresh vegetables and beautiful fresh fruits as well. Throughout the city you can find kafanas (traditional Macedonian restaurants) that serve tasty fresh salads, grilled meats and other culinary delights. 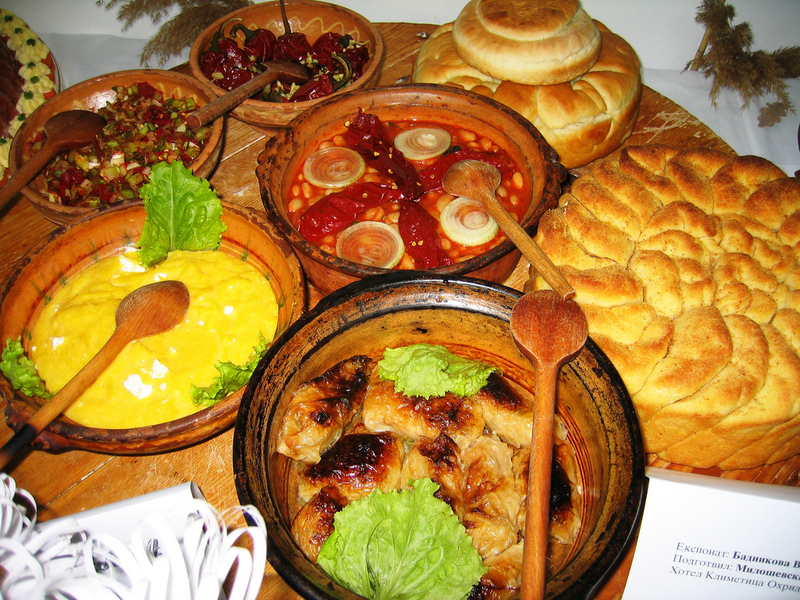 Some dishes that you should try include Tavce Gravce, Pastrmajlija, Kacamak, and of course Turli Tava. 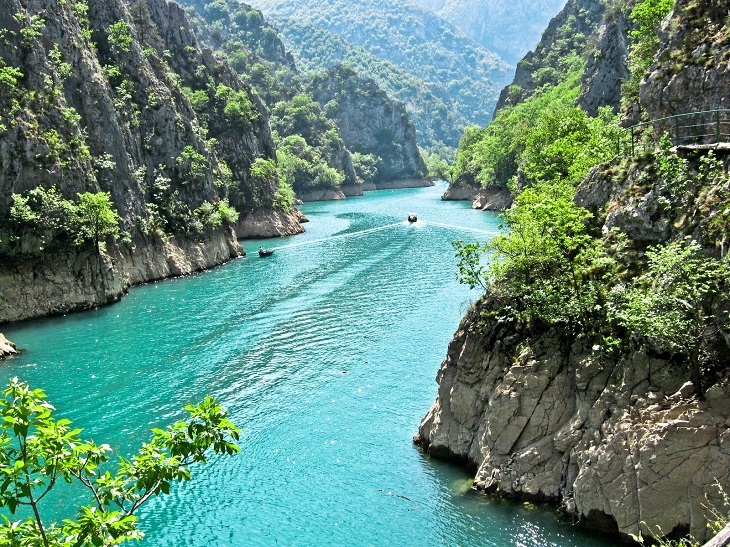 Macedonia is home to beautiful lakes, big national parks, and mountains combined with a wide range of outdoor activities. You don’t have to go far to enjoy beautiful nature. Mount Vodno is a great option for short getaways to the nature when you had enough of the city or if you simply want to enjoy some fantastic views to the surrounding peaks. On the top of the mountain stands the Millennium Cross, which is a 66-meter tall cross, built in 2002 to commemorate 2,000 years of Christianity in Macedonia. It is possible to trek all the way up to the top from the city center. However to save time and your breath, you can also take a bus or a taxi to halfway up the mountain called Sredno Vodno. 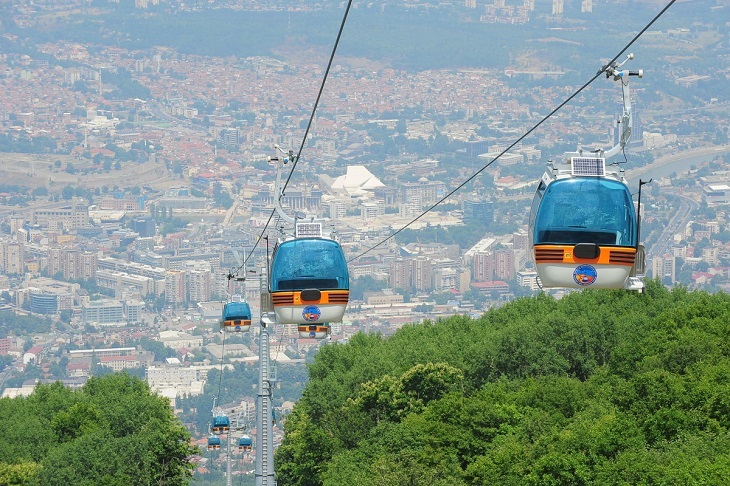 From here you can either hike or simply take the cable car and enjoy the stunning views after a quick 8-minute journey to the top of Vodno Mountain. There are archaeological findings that prove people were growing grapes in this part of the world in the 13th century BC. The combined influence of the Mediterranean and continental climates – the country enjoys 270 sunny days per year – give the intense aroma of the Macedonian wines. The country produces excellent, full-bodied, fruity red wines such as the Vranec which is the best expression of Macedonia’s terroir. Even if you don’t travel on a budget it is important to know that in Skopje you don’t have to worry about breaking the bank. The prices are much cheaper than the European average. It is not only affordable but also you will get great value for the money you spend. With the many constructions and new buildings about, Skopje’s look is rapidly changing. Walking around the riverfront travelers will notice the new Neoclassical architecture that has been chosen for the city. They are all the newly built monuments of the ‘Skopje 2014‘ project. Even though not all of the locals agree with the choice, it is actually interesting to see Neoclassical architecture with a modern take on it. Skopje is a city in flux, seeking to revitalize its image. If you visit now and return a couple of years later you might find an entirely different capital. While in most cases you can’t get a sufficient grasp of a country from only one place, Skopje is actually fairly representative of the rest of Macedonia. If you only have a short time, Skopje will give you a decent sense of this small country. Travelers can see the wonderful mix of Christianity and Islam, the mountainous terrain, the friendly locals and interesting history. The best way to explore Macedonia is by car, so rent a car in Skopje or hire a driver and prepare yourselves for an amazing road trip. With low-cost carrier airlines starting to offer cheap flights & connecting Skopje Airport with the rest of Europe, more and more tourists visit the country every year. While it is still not a touristy destination, it’s just a matter of time before tourism picks up. It’s easier than ever to get to Skopje, either by plane or bus, and this is the time to enjoy genuine Macedonia.